There are two main differences with the occupants of a vacation rental vs. a standard rental property. The difference in the length of stay is pretty obvious… vacation rentals tend to be short stays where traditional tenants sign a longer lease. What we’d like to focus on is the mindset of the vacation rental guest. There’s a reason people drive more aggressively with a rental car compared to the car they lease. It’s a different mindset when it’s a short-term rental. The same can be true of vacation rentals as well. Why not shut the fan off for a hot shower because you like to pretend the rental has a steam room? Knowing that your guest may have this viewpoint makes it important you screen your short-term tenants with as much vigilance as you would a standard renter. Here’s a quick list of tips you can implement into your process to screen your short-term guests. Social media posts can say a lot about person’s lifestyle and living conditions. You’re looking for obvious photos that indicate someone lives an ‘Animal House’ inspired lifestyle. However, many people will have two social profiles. Let’s use Facebook for an example. If you have the name, email, and phone number of your applicant. Try searching all three separately in Facebook. Some people will have an account set up using their phone number and a separate Facebook account attached to their email address. If they have two accounts there is a good chance they created a professional looking profile for job purposes or perhaps to keep up appearances for family. It’s the other profile that will give you a better idea of any potential red flags they might be publicly sharing. Having more than one person’s name on the agreement can be helpful in spreading the responsibility. This can be achieved by requiring a co-signer for the rental. Someone else who will be responsible if repairs are needed. Just having the understanding that someone else will be affected negatively can keep people on their toes. If you’re not charging a sizable security deposit on your rental you’re asking for trouble. A security deposit does more than just create a deposit you can withdraw from if there are damages. It will discourage people with potentially harmful plans. The Best Man planning a ruckus bachelor party is not going to want to put up a sizable security deposit on his dime. He’s going to look for a rental that will limit his liability if the party gets out of hand. Charge a good security deposit and you’ll scare away suspect tenants. If they’re currently renting, ask if you can reach out their landlord. 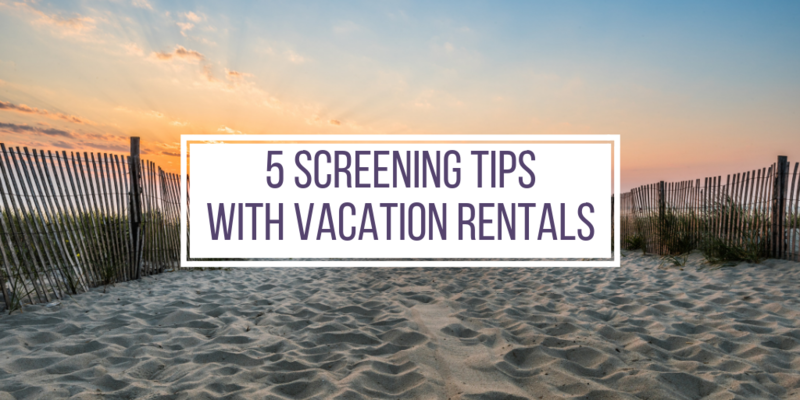 A quick conversation with the landlord will help give you confidence that you’ve found a great guest for the vacation rental. This step may take a few extra minutes but you’ll know right away if the renter is reluctant to provide this information that they may have something to hide. Many times people start running background checks AFTER they’ve been burned by a bad tenant. Our advice is to always be proactive and run a background check as your last screening measure before handing over the keys. Has this person been evicted in the past? Do they have a history of violent crimes? Identifying any potential red flags before you hand over the keys is crucial. For anyone managing someone else’s asset you’ll want to run a background check because it’s not a good look when a convicted felon causes substantial damage to the property. RentPrep is a tenant screening service based out of West Seneca, NY that services over 40,000 landlords and property managers nationwide. They have a team of FCRA Certified Screeners that hand-compile reports to ensure accuracy and are available by phone, email, and live chat to discuss your reports. We’re proud to be integrated into the RealTimeRental platform to keep your vacation rentals in good hands.